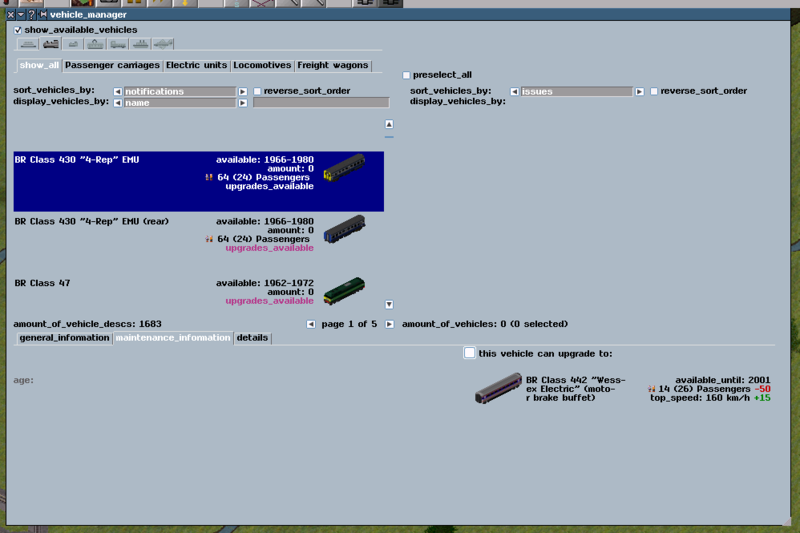 This thread will be about the new window in Simutrans Extended, currently called the "Vehicle Manager". I have previously mentioned it in other places, but I believe it never got its own thread, so here it is! The thread is intended to be partly to show the progress and to get opinions on how it should function and what to have in the window. Currently, there is a sorting combobox on top of each vehicle field. They are currently limited to just a number of sort options, but those will be extended to further options. Pro's is that the player should immediatedly recognize the tabs from the depot. Con's is that it is not 100% accurate with some flaws on edge cases, and that also players might want to see vehicles from two groups simultaneously. If not using the depot window tab approach, one could instead have a set of comboboxes with display parameters and numberinputs (see my suggestion for the right hand window selection system below). It would be easier to finetune just exactly what you want to be displayed with the risk of it being very tedius and unintuitive. I anticipate also that James will eventually implement some feature of "inseparatability" designed to handle multiple unit vehicles, say articulated busses or permanently attached cars, which cant disconnect outside the depot. The idea in the window is that it is supposed to be able to show the permanently attached unit as one entry, making it easy for the player to see how many such units (s)he has. That could also be sorted with tabs, alternatively just a button "separate articulated vehicls", to make each part of a multiple unit vehicle go into its own entry. It is very easy to select one or a few individual vehicles, and its even easier to select all vehicles, just by pressing the "select all" button. What is difficult, however, is to select a bunch of vehicles, since you quickly loose track of which vehicle to select, and it is simply tedious to select multiple individual vehicles. When you have, say 100 horses, and you want to select around 50 of them because those 50 should be upgraded to stronger horses, you need a way to quickly identify which 50 horses you need. With the existing sorting mechanism, you can easily sort by age, but that will just make your desired horses the 50 topmost entries, not select them. For that, you would still have to click each horse for selection. What I had imagined could work is some kind of display system, where the player can narrow down the amount of horses displayed in the list by having a combobox and a number input. The combobox would have entries like "bought before year", "bought after year", "overhauled before year", "overhauled after year", "wear remain minimum", "wear remain maximum", " etcetc, and in the numberinput you can specify a value, say "1956" if it is a year value. One could have two or three rows of such comboboxes and numberinputs to help further narrow down the list. Then in addition to that a new button that says "select visible" which will select all vehicles that is now visible in the list. The tabs benieth the vehicle selection fields will be the place where the action takes place. I have now just created some tabs and called them something, but I am not sure with what grade of detail the tabs should be made to. * Additional information from vehicle_desc_t about upgrade information, livery information etc that is currently not displayed in the depot. * Information about the specific selected vehicle: Odometer, Bought year, Overhauled year, Upgraded year, Income, etcetc, simply all information that is ever available about individual vehicles. If more vehicles are selected, I would suggest this information is still visible, but is displayed in ranges, like "Bought year: 1840 - 1849". * Actions that the player can perform on the vehicle. This would largely be buttons like: "send to depot", "upgrade", "change livery", "delete on layover" etc. Simply every action that is available to the player. The window should send the command to whatever convoy the vehicle is traveling in and tell the convoy what to do with the vehicle. In case with the "upgrade" command, the window would have to perform basicly all the same actions as the current "replacer tool" available from todays convoy windows does. - This would hold some of the technical information that is important in regards to the health of the vehicle. That would be the odometer, the build year, when it was last overhauled, how much wear it has taken, as well as what vehicle(s) (if any) it can upgrade into, and the cost to do that. 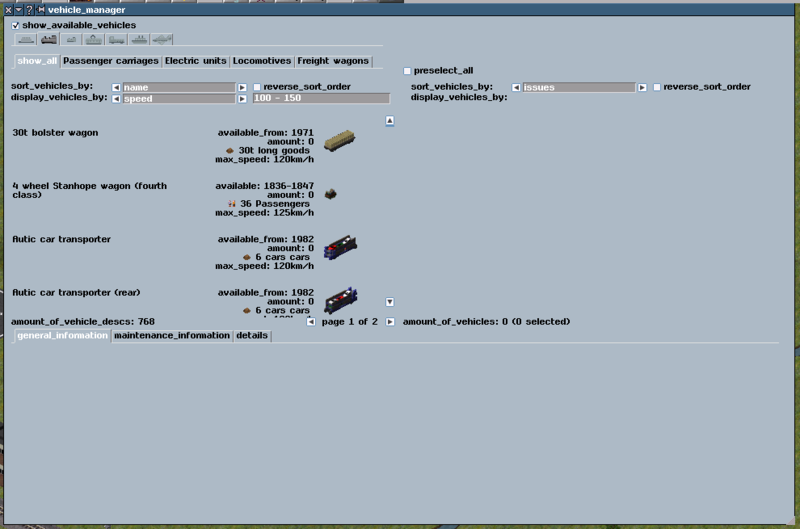 The buttons for upgrade, overhaul and other similar functions would also live here. - Revenue for the vehicle, along with all other echonomic statistics that might exist, and possibly the change livery button. For passenger- and mail vehicles, the classes would be reassignable from here too. - A tab that holds "dangerous" buttons, like delete, send to depot and similar commands. - A tab that is a combination of the previously mentioned Echonomics and Advanced tabs. Thank you very much for working! I tried to compile new change but I could not. In this code, there are no need to write "vehicle_manager_t::" class qualifiers since these functions are already in-class function. This compile error is compiler dependent, so I think that it should be corrected. Thank you, I have uploaded your fix to Github! I am a little unsure if that was the compiler dependent error, or are there still some other error? This is very interesting - thank you for starting this thread. I am a little preoccupied with bug fixing related work at present, but I will have a look at this in a little more detail when I have time. It does look promising, however. Phystam, where you able to compile it now? Yes, I could compile it! 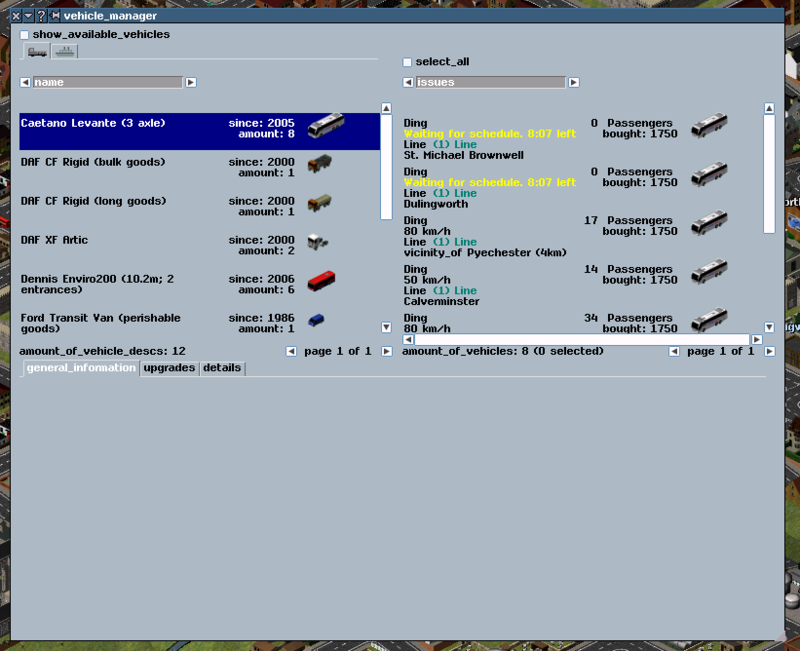 I have uploaded the sources for a new version of the vehicle manager to GitHub. Still, the window is not really usefull for anything else than see the "dat file information", as found in the depot, however improvements have been made to the listing, and displaying of the vehicles. Also the list of upgrades are available in the correct tab. Thanks, and thanks for the heads up with spelling! I have attached some screenshoots to this post and am also uploading a binary, so you dont have to compile yourself. Remember, though, that you still need to have the correct menuconf.tab, so you will need to duplicate an existing pakset and replace the menuconf.tab with mine. It is compiled on MSVS1015, so I dont know if the executable will run on any type of machine. This tool handles very well, it is well thought out and could turn managing larger maps into playing larger maps. I'm quite taken in with the possibilities of smart vehicle/convoy replacement in combination with the vehicle schedule management overhaul. The windows are player based, switching between players does not cause the windows to disappear. Is this intended to aid people running multiple companies? There is no sort_vehicles_by: retire_year on the left panel. 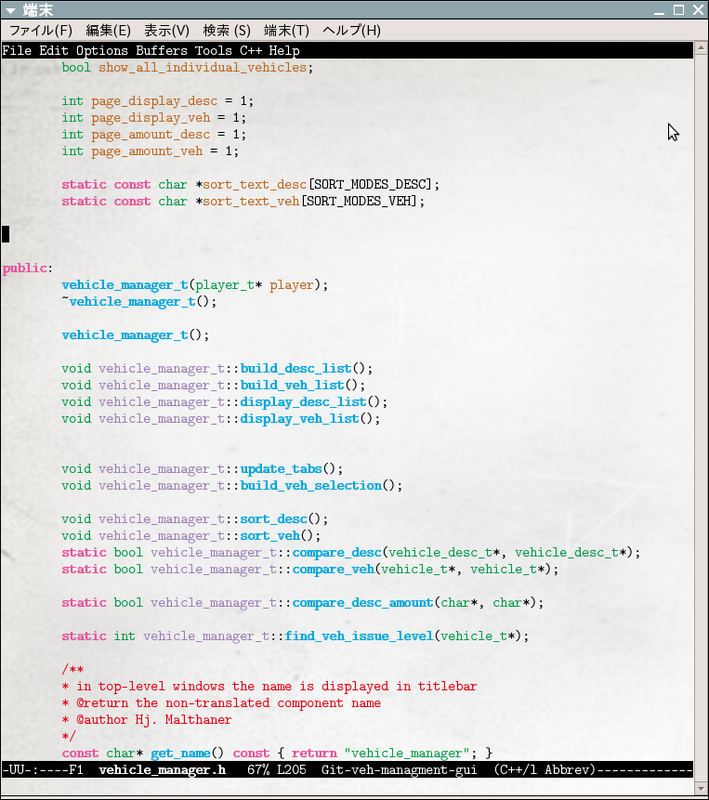 The display_vehicles_by: selection is very good and adapts great between input options. Comfort doesn't yet seem to filter properly. You don't mention it which doesn't exclude intentions, but also having the retire date in the maintenance information tab would be handy. 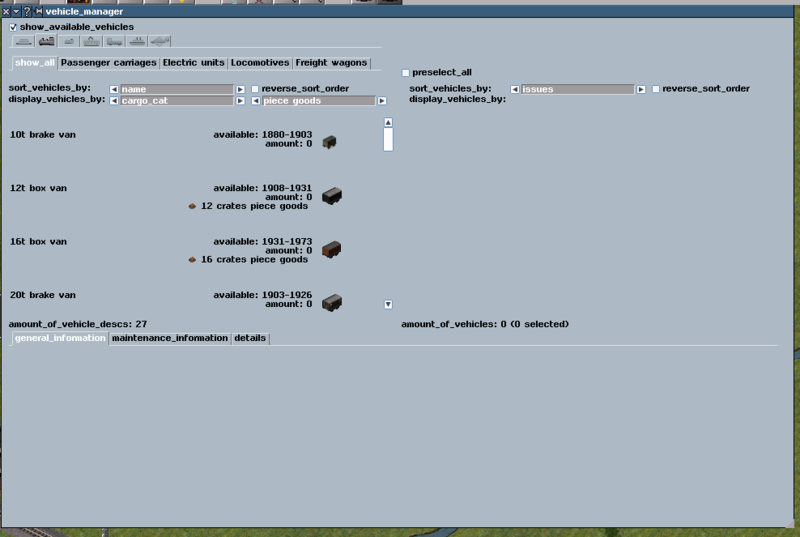 Could preselect_all up on the right side enable the same selection and deselection style on the left as on the right? In a similar vein, could it be implemented that holding shift when selecting one vehicle and a second vehicle auto-select the intermediate vehicles in the list? I don't want to criticize too much, since you have a vision for the tool and many items I list are probably in line with your intentions anyway. This is on a Linux Mint machine, running wine. Due to the following error I've only poked around in the default loading save. Why are you running simutrans in wine? You can compile native Linux executable. Thanks! Yes one of the big aims with this window is to easily identify large amount of vehicles that needs attention across the entire map, and allow you to make alterations to them. I will make som class reassign tools, a way to upgrade them, a way to replace them, order them to overhaul, sell them etcetc. Basicly as many functions as possible. It follows the same "rules" as the schedule list dialog. You can open the schedule list for one player and then switch player and open another schedule list for that player. I have no opinion about wether it should be possible or not, but I think they should behave in similar ways. True, do you think it is wortwhile to have? Thanks, Im happy to hear this! Did you figure out the syntaxes that I had prepared? And thanks for the bug report, there was a bug which I have fixed on my local branch, but not yet uploaded. True, I have not yet really designed that tab yet. I think it should hold a mix max of "maintenance" information about the individual vehicles in general (age, odometer, wear, time since last overhaul etc) as well as some command buttons (send to depot, upgrade, replace etc). Having the retire date there too might be usefull, thanks! Currently you can only select one desc to be displayed on the right. I have thoughts of making it possible to select multiple vehicles on the left, but I think that would have to come in at a later stage, when James have dealt with the (hopefully to be implemented) feature of "permanent attached vehicles". Im very happy to have your views, thats after all why I post about it in the first place! It is easy to grow blind on what you are doing, thinking that it is what everybody else wants, and then one have created something that is way beyond the target or extremely complicated to use. I know that it is not (really) possible to load an existing game map, but I dont think that is because of my window, but rather that this window exists in the new vehicle reattachment branch of simutrans. If you create a schedule, you will se that the schedule look different with lots of new (not working) options. Technically, I could create the window in the master branch of simutrans, but given the aim of the window, I initially thought it best to create in this branch. I have uploaded the latest version of the window, and I have added a few bits and improvements, among others certain display by entries is made with a combobox. I think it can help increase players awareness of what vehicles are to end their sales soon. I often encounter the case where lines need additional vehicles, but the vehicles currently used are no longer for sale. This results in either replacing perfectly able convoys or creating another layer of complexity in replacing vehicles in the future. (2) How do you mean? (1) I understand it's a difficult task. Programming is difficult and if a player properly utilizes the filtering system they will be able to do just fine on their own. 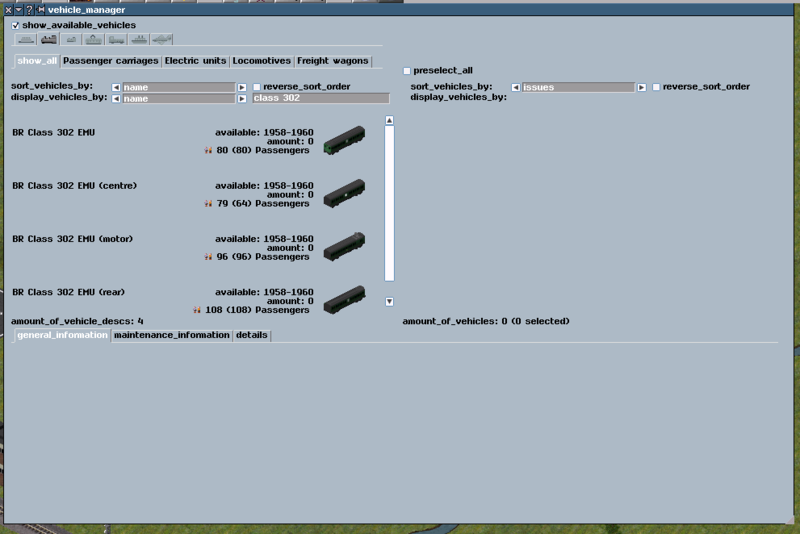 (2) Currently one needs to select the vehicles in the right pane to issue orders to them. But there is no multi-selection on the left side. If you tick the "preselect_all" box, could that allow multi-selection of left side items? The thought here is e.g: An EMU consists of several vehicles. If you are able to select all of the found units on the left, it could allow replacing all vehicles in that selection. I think my example isn't very clear and you reference "permanently attached vehicles" which are most definitely a solution to the issue I raised here. I think it best to wait for the integration of such before we elaborate on a topic that will resolve itself regardless. I was able to load one savegame (this was a fluke). It ran well, even if all lines were empty as the schedules did not fit any lines. I can't comment on whether it loads again, as it seems any hibernation on my machine re-allows for one loading of a game. I'll edit a small guide if I get it working in the stickied thread. If you could make a better guide I would be very grateful, since I'm still quite new to Linux and am very liable to posting humbug/bad practice. True, that sounds reasonable 🙂 one could also expand the display by to add further information! Yes, the display by feature came to life when I realized that the player might want to select a big bunch of vehicles out of perhaps thousands. Currently there are not so many display by parameters but it should be quite easy to add more. I was thinking wether it would be worth having two display by boxes, in order to further narrowing down vehicles but that might be redundant and would also further clutter the window. Yes, once we know how the reassemble feature will work more precisely it will be easier to work with that idea. I would like to have a checkbox that toggle permanent attached vehicles to be shown as one entry in the left list. The idea is to get entries that consists of complete DMU's or steam engines and their tenders. Each variant of the DMU's would have its own entry, so if for instance you have made a DMU that consists of DMU model A and B, and another DMU with DMU model A and C, it would show up as two different entries in the left list. Selecting such an entry would display all vehicles making up the DMU's in the right hand list, and performing actions would affect all of the vehicles. When that is implemented, the step to make normal multi selection from the left hand list would be quite small.